His observations about people’s orientation and decision-making are spot on – but I come to a different conclusion. Instead of seeing the current market environment as ushering in the “twilight” of brands, I view it as a call to arms. Brands and brand-building are more important now than ever before. I hold this different – and hopefully more instructive and insightful – perspective because I view a brand as far more than a label or logo. A brand is the bundle of values and attributes that define the unique value an organization delivers to customers and the unique way the organization operates. A brand is a strategic platform for managing and growing a business. In the research I conducted for my new book, What Great Brands Do: The Seven Brand-Building Principles That Separate the Best from the Rest, I discovered that this understanding and use of a brand is what distinguishes great brands. Instead of external images to promote or messages to communicate – which, as Surowiecki points out, produces a diminishing return today – brands are management tools that leaders use to fuel, align, and guide everything their organizations do. When I look at the world today, I see tremendous opportunity for brands to create real, sustainable value for customers and companies alike. ChangeThis just published my manifesto in which I explain the developments that are influencing brand-building today and what great brands are doing about them. 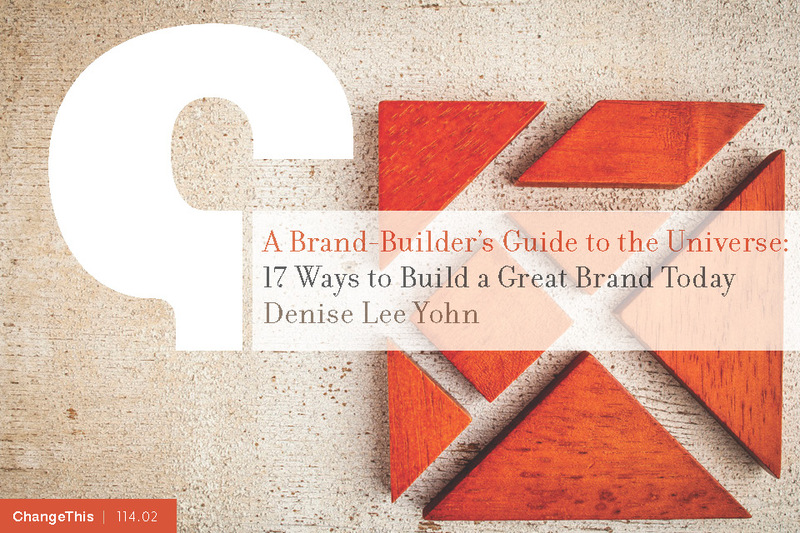 Please download the manifesto, A Brand-Builder’s Guide to the Universe: 17 Ways to Build a Great Brand Today — and let me know if you agree.